We could count on the fingers of one hand — maybe two — the number of women who have this activity. Sabina Santos has been manufacturing pipes for only two years. Let's go to Portugal and visit Sabina's workshop. She made the first step shortly after the birth of her baby boy, Gil. This is partly thanks to this little guy, because this activity allows her to work at home and stay close to the baby. 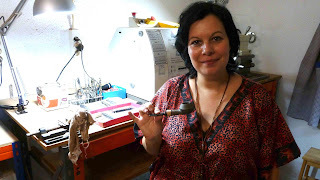 But if she started this craftmanship, it's also thanks to her husband, Paulo, who is a pipe smoker and likes Latakia blends, who also used to make pipes in his spare time, but now prefers building and driving model airplanes. 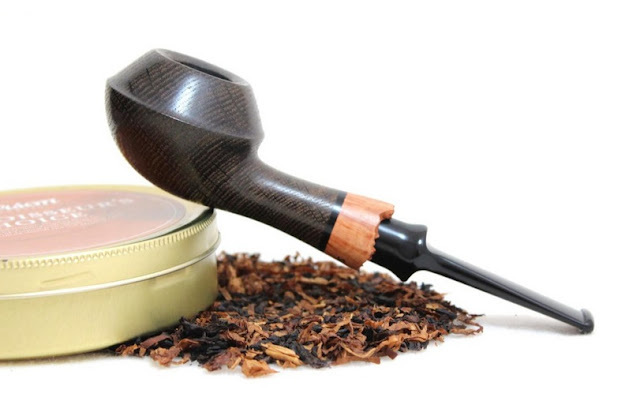 Gradually, with great humility and the generous advice of other countries pipe makers — for instance Greek Chris Asteriou — Sabina cut, drilled, sanded, polished, rusticated. She loves the classical shapes made by Chris, but equally admires the achievements of another Greek pipe maker, Konstantinos Anastasopoulos, also the American James Gilliam, the German Maike Paessens or the Ukrainian Konstantin Shekita. During those two years, only 90 signed Sabina pipes came out of the workshop, most of them made with Italian briar, sometimes from Greece. By creating such an amazing Soul series, with carved and pierced wood, resulting of many hours spent digging with Dremel, she distinguished herself. But more traditional forms have also been explored, often rusticated, like cells of a beehive. "I love rusticated pipes", Sabina confessed, recognizing that she begins to make smooth ones. Some other Sabina pipes result of commissions from around the world. "When I make a commissioned pipe, I inform my customer by sending him pictures of my work, step by step", Sabina said. A way to do which fully satisfies her customers with who she has a direct relationship. In the well-equipped workshop established in her home, in a small town 20 minutes away from north of Lisbon, Sabina's improvements seem awesome. In only few months, she made decisive leaps forward. With enthusiasm, she opened her workshop to me. At this moment I immediately fell in love with her latest makings, still on the bench: two rhodesians. 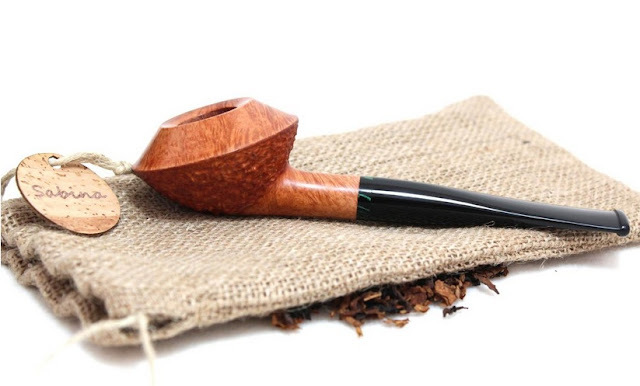 First, a briar one, partially rusticated, with a lightly frontwards tilted bowl. Drilling (always performed at 4 mm) is perfectly centered. Anyway, the word perfect can be applied to all the look of this pipe. The other one is a beautiful morta pipe with wonderful lines, including a plateau briar stem extension. "I made lots of pokers, but now I love making rhodesians", Sabina said. She has made here her first morta pipe. In my opinion, a master work. And a great way to celebrate the second anniversary of pipe making. The young lady and young mother is now waiting Gil's first school year. Thus, she'll have more time in the day to work in her studio. "But I will miss him", she said. About her husband Paulo, he is her first fan and encouraged her in all of the steps of her learning and craftmanship. Together, they discuss future shapes. Paulo smokes at night especially English or Balkan blends, Dunhill, GQ Tobaccos, or Peterson Old Dublin. When Gil sleeps, Sabina also takes a break, preferring the sweet aroma of Peterson Sunset Breeze tobacco. Sabina Santos is not in a hurry, and she prefers improving her work day by day rather than manufacturing in large quantities. "In the future, I intend to make stems all by myself from ebonite and cumberland," she explained. Patience and time... But two years after her beginning, the improvement is significant. These two rhodesians marks the entrance of Sabina Santos in a new era: the one of craftsmen who know how to combine technic and fluidity. To which I would add kindness and outstanding sense of welcoming. Obrigado, Sabina!